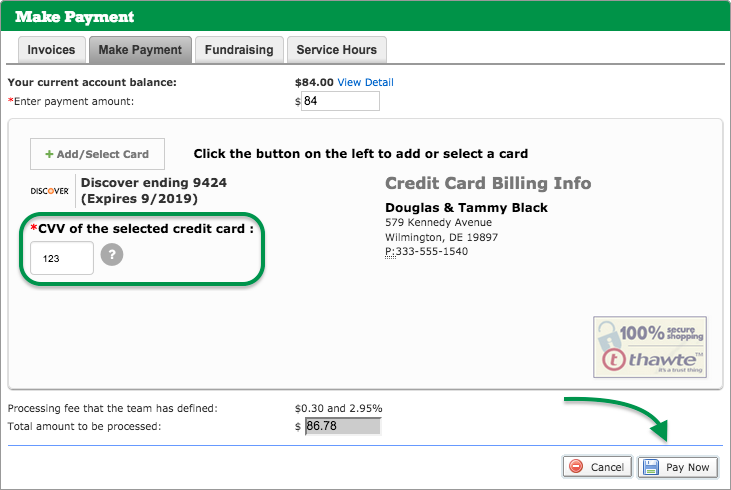 As a non-admin on your team's TeamUnify website, you have the ability to make a payment at any time you like. Just follow these steps. Sign In to your TU site. In the side menu, click My Account > $ My Invoice/Payment. Click the Make Payment tab. By default, your full account balance will appear in the Enter payment amount field; change it if desired. If you do not have a credit card on file, click Add New Card, fill in the data (you may click Copy From Account Info to speed the process) and click Next. Otherwise click Use this card by the credit card you wish to use. Enter your credit card's CVV code. Click Pay Now and OK to confirm. Note: These steps will only work if a team admin has enabled the ability to make on demand payments on your TeamUnify website.